Truth in war zones is hard to find. Two of the RAAF’s Air Task Group's (ATG) F/A-18A Hornets return to base after striking a Daesh Armoured Personnel Carrier in Syria. CANBERRA -- As the U.S-led Operation Inherent Resolve prepares to mark 1,000 days in the campaign to defeat and destroy Islamic State, the usually pretty secretive Australian Defence Force (ADF) has dropped a significant announcement about transparency that's not got a lot of attention. The ADF is offering to be clearer and more timely on what it is doing on behalf of Australians as it takes on the militants in Iraq and Syria. It comes after the Coalition released its civilian casualty report on Monday, which found at least 352 people had been killed by Coalition air strikes since 2014, but none by Australia, as the ADF later said in a separate statement. I'll get to what the ADF are exactly doing in a second, but first some background. For years, there's been ongoing criticism about a dearth of Australian information about military operations. Australians were first deployed to the latest Middle East theatre in August 2014, and as Sky News' Political Editor David Speers pointed out last week, "We get a briefing roughly every six months from an official in Canberra and the Defence website pumps out press releases and lovely photos from its enormous media wing". "When was the last time you saw our soldiers in the field telling their story? When was the last time you saw the Chief of Defence do an interview?" Speers asked fellow media types at the 2017 Press Freedom Australia Dinner in Sydney last Friday. The Mosul attack last month which involved, but did not injure Australian military advisers only came to light thanks to the U.S Military and American media. And just what has been happening in Australian airstrikes? Syrian and Iraqi civilians are being killed in Coalition airstrikes. It is a fact that the Americans have acknowledged it. Defence states it takes "all allegations of civilian casualties seriously". It says all ADF personnel operate under strict rules of engagement "designed to minimise the dangers to civilians and comply with Australia's obligations under international law". We just don't know any more than that. Until now. The ADF has announced it will start publishing fortnightly reports from next week on the airstrikes it carries out in Syria and Iraq, including summaries of bombing targets and locations. It will also report "credible claims" of civilian casualties against the ADF "on occurrence". This offer to be clearer on what it is doing is happening because, again, the U.S. Defense Force is leading the way. On March 4, Combined Joint Task Force – Operation Inherent Resolve (CJTF-OIR) announced a review of airstrike reporting and the ADF followed suit. It was a hard call for the ADF. "This decision comes after weighing the importance of reporting ADF airstrikes in Iraq and Syria against the potential propaganda advantages it might provide Daesh and any risk to the safety of ADF personnel on operations," Defence said in a statement. "The Coalition is operating in a dynamic and complex environment and Daesh is a ruthless enemy. "Streets and buildings are booby trapped, and Daesh fighters capture civilians, holding them hostage and using them as human shields." 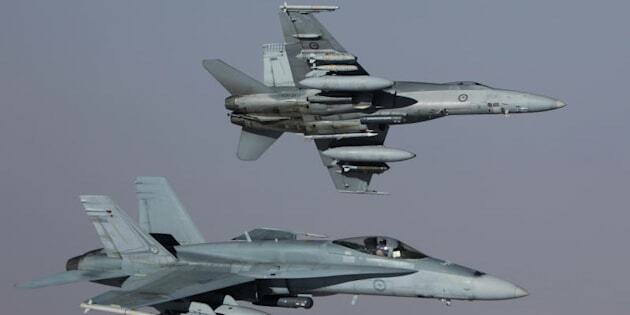 The non-government organisation, Airwars, insists the Coalition civilian toll is much higher. By its reckoning more than 3000 deaths. This means military reporting of Coalition airstrikes can now be compared with on-the-ground civilian and media reports. Truth in war zones is hard to find, but the ADF has just opened a door.